Book a call to find out if Thrivestry is right for you! Generally, most people come to the gym for 3 things; To look better, feel better, and/or to perform better. The class curriculum (aka ‘programming’) is one of the primary tools for delivering these results in safest, fastest, and most sustainable way possible. Thrivestry (pronounced “thrive”-“stry”) is the combination of the words ‘thrive’ and ‘mastery’, and was created as a concept to represent mastering the art of thriving at life. We believe that we can do more at the gym than just an hour of sweaty ‘exer-tainment’, and that the pursuit of movement mastery helps us master other aspects of ourselves and our lives. The use of the word 'mastery' is deliberate. 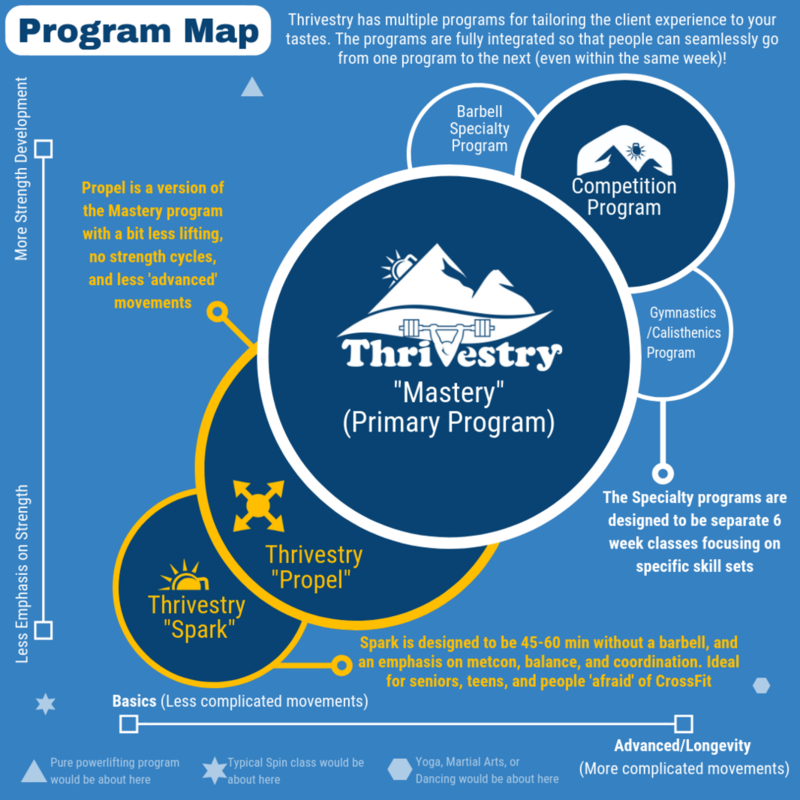 We do not consider Thrivestry a 'Strength Biased' Program or a 'Metcon Biased' program. It is a 'Mastery Biased' program! I am Jeremy Jones, the lead Programming Architect for Thrivestry. I originally started out as an Engineer and amateur mixed martial arts fighter / instructor. In 2004 I started doing CrossFit to prepare for my fights and occasionally driving to the original CrossFit gym in Santa Cruz to be trained by Greg Glassman and workout with people other than myself. 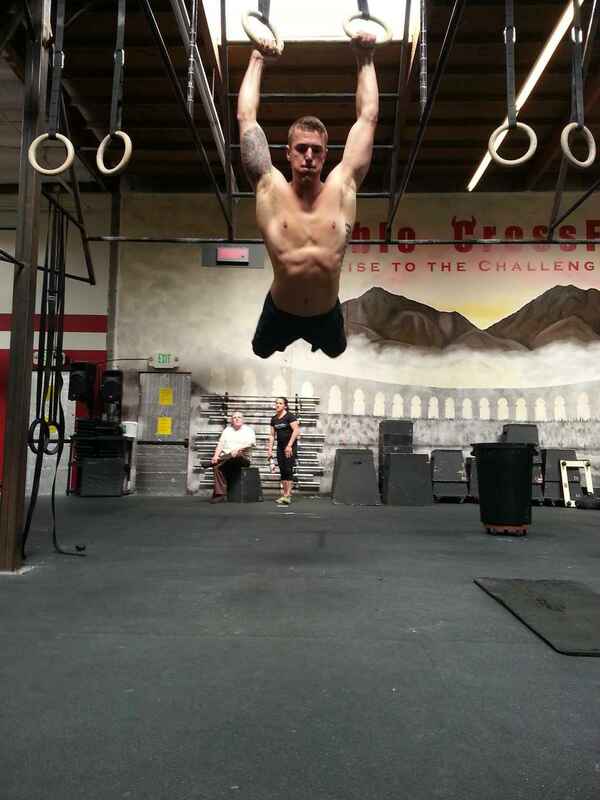 In 2005 I co-founded one of the oldest and most successful affiliates: Diablo CrossFit. I have been programming workouts uninterrupted, 7 days a week, since 2006 and I have clients that have been doing my workouts for over 10 years. 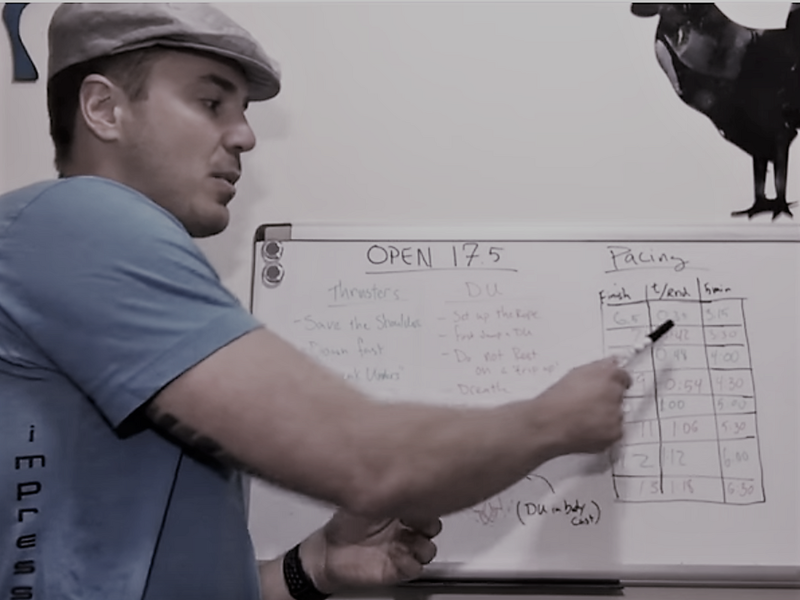 After programming for hundreds of athletes per day at Diablo (over a thousand total members at the time), I started programming for multiple locations, and then began helping other gyms with their programming remotely. The competitive athletes I coached at my original gym have had nearly 100 unique appearances at the Regional and the Games, with a number of podium finishes at the Games... But I am most proud of the thousands of 'regular folks' I have helped live better lives through awesome programming and amazing class experiences. More than 13 years later I am no longer part of Diablo, I do programming full time and I love helping coaches and gyms all over the world learn how to become more awesome! "Without deliberate planning, progress is slower, risk to injury is higher, and many people will stagnate after the 3-5 year mark." It all starts with planned progressions, scheduled throughout the year to match up with calendar days and events. On the surface, the movements and the patterns are ‘seemingly’ random. This aspect of constantly changing movements helps keep things interesting while driving adaptation. This structure is the framework that guarantees progress over the long haul. Without deliberate planning, progress is slower, risk to injury is higher, and many people will stagnate after the 3-5 year mark. With the foundation set, we layer on additional pieces that will help people with their goals and keep it ‘interesting’. Conditioning for body composition and performance. Mobility for health and to ‘feel better’. Context to provide direction on internal growth and personal development. Etc. The key is that these pieces all work together to produce sustainable progress toward becoming a happier and more complete human. "Performed alone, the program has the power to change bodies. Performed with people who will challenge and encourage each other, the program has the power to change lives." We believe in the ‘family style’ version of class programming. Forcing people into a program with limited options for scaling or limited approaches to skill development is like people going to a cafeteria. Their tray will be filled up with whatever is being dished out no matter what their preferences are. Some things will get ‘eaten’ heartily, a lot will get wasted, and satisfaction will be low. Programming that is served in courses ‘family style’ will allow everyone to eat at the same table. Everyone gets to share the same meal and same company, but they get to pick and choose how much of each dish they want to indulge in according to their own goals and desires. Every minute at the gym is gold. The format for the programming should be as efficient as possible so that no time is wasted. By setting up movements that can overlap without affecting one another, we can effectively double the usefulness of certain parts of the class. By combining coaching and skill work, we can improve strength, speed, stamina, as well as movement quality and safety. By giving guidance on how long things should take and tips for coaching, we can make sure that people aren’t standing around 15-20% of their gym time waiting for others to finish. By having optional ‘extra credit’, we can make sure people can get more out of their visits to the gym. Very few people can stick with monotonous curriculums that don’t include elements of variety and community. While the programming packs as much movement practice as possible into the classes, it is set up for people and coaches to interact, have discussions, play games, etc. There is enough flexibility for coaches to put their own personalities into their classes, and there is enough for people to use whatever approach they like that day. Whether that approach is ‘just for fun’, ‘I want to go hard’, or even ‘I am glad I just showed up’. One of the keys to sustaining the training long term is to be able to show up no matter what your state of mind is that day/week/year, and not just when you are feeling good. Make no mistake. This is MORE than just intelligently designed workouts meticulously planned in advance to provide the most benefit. 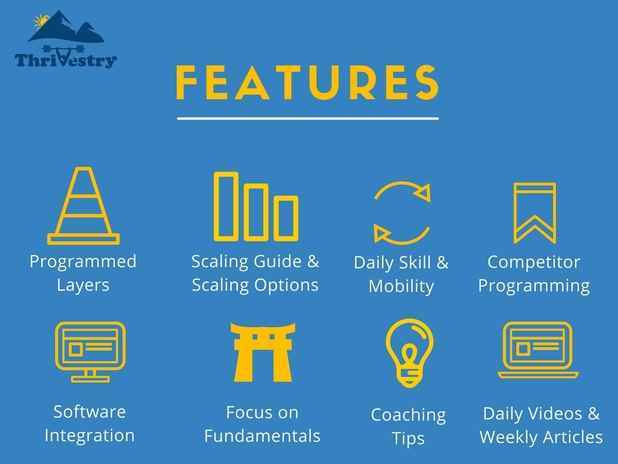 Thrivestry also provides daily videos, weekly articles, graphics, and more to make sure that you are learning about why we are doing what we are doing, and to make sure your coaches are all on the same page. Much of the content is also directed at clients, so you can share the knowledge with them and turn them into 'programming connoisseurs' who never want to leave! Few things in life give us back 100% of what we put in. We believe that a journey toward movement and self-mastery is an investment that pays back 100% and then some. The journey needs to be approachable for all levels, it needs to make people look/feel/perform better, and it needs to be sustainable for the long haul. We believe that Thrivestry will help you master your workouts. Master yourself. And ultimately, master your life. Save 30+ hours per month invested to create the programming! Take out the constant stress of worrying about when it needs to get done. How is our programming different? What Gym Owners Are Saying ..
CrossFit Journal Article June 01, 2016, "PROGRAMMING: IN-HOUSE OR OUTSOURCE?" We have multiple programs that all fit together into one system. "Mastery" is our main program that gets the fastest results. "Spark" is our no-barbell program that sticks to the basics and can be done in 45 minutes. "Competition" is our program for people looking to compete in the sport of fitness and similar events. "Specialty Programs" are additional plans that can be added on to focus on specific skills. These programs all overlap so that people can seamlessly go from one class to the other according to their goals! We love helping coaches become AWESOME! Click on any of the coaching tools below to download and use it in your next class. Gym owners around the world rave about how useful these tools are in helping clients have fun, engaged, get sweaty and continue moving while injured! We've created an organized and categorized list of over 300 circle questions or 'ice breakers' to help give you ideas of what type of questions you can be asking during your classes to help people get to know each other and to help build stronger communities. Download it free here! Download a PDF that you can print out for your gym. It has 60 different 'Cashouts' categorized by 5 different elements that make up the core of each micro workout. Now your clients can continue to move safely during recovery from an injury. This list provides a complete scaling and substitutions for all movements programmed in Thrivestry.